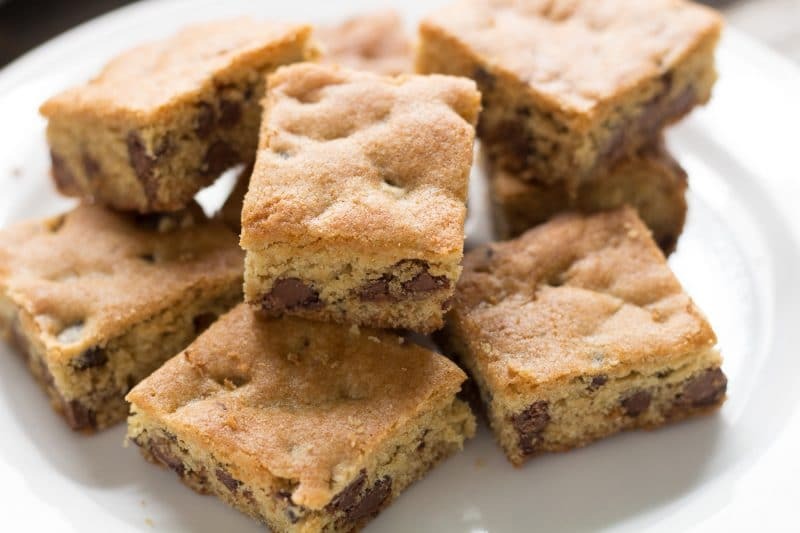 Large Batch Chocolate Chip Cookie Bars. soft, delicious cookies designed to serve a crowd. 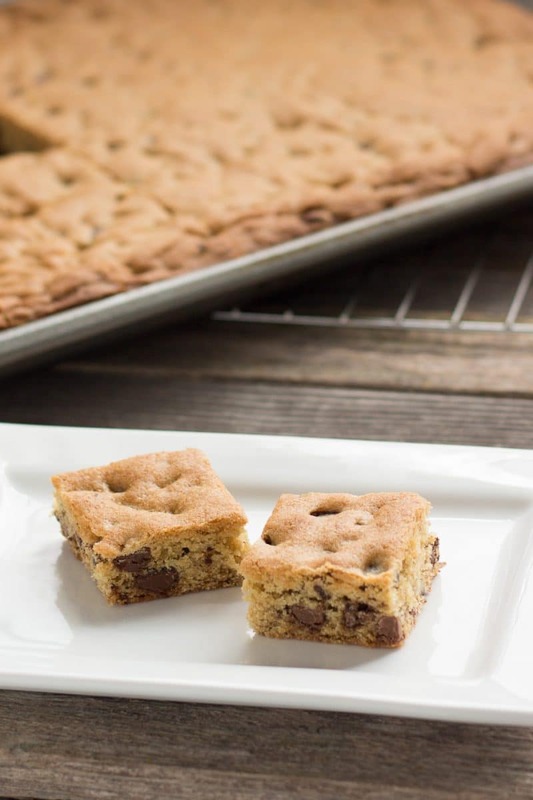 This chocolate chip cookie bar recipe is the perfect way to get a whole mess of chocolate chip cookies made all at once! I know that probably just about everyone has had or even made a pan cookie, but this recipe is different because it makes so many more than the recipe on the back of the bag. The sheer amount of batter packed into one large pan is the difference. Making this recipe in a large barge reduces the amount of drying out that sometimes happens when baking chocolate chip cookies or bars. Let’s face it, we have all walked away from a batch of cookies when one minute made all the difference. I use this recipe anytime I need to make a sweet treat for a crowd. 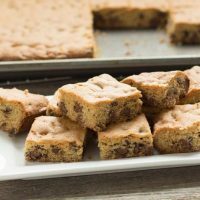 Large Batch Chocolate Chip Cookie Bars makes about 48 2-inch X 2-inch cookies in just under an hour when using an 11 X 17 sheet pan which is the same one I use for making Ice Cream Cake Roll. It also reduces the number of dishes to clean. A pan that is an inch larger or smaller will also work. If you like your chocolate chip cookie bars thicker, I recommend using a smaller baking dish. The number of cookies may be more or less and the thickness may be a bit different, but it will work just fine. Increase the baking time by 2 to 3 minutes for thicker cookies and reduce baking time by the same if the pan is larger. I have successfully used my 10X15 as well as my 12X16. Honestly, I usually just grab whichever one of my large pans that are handy. I tend to bake by smell. If I can smell it, it is time to go check it. 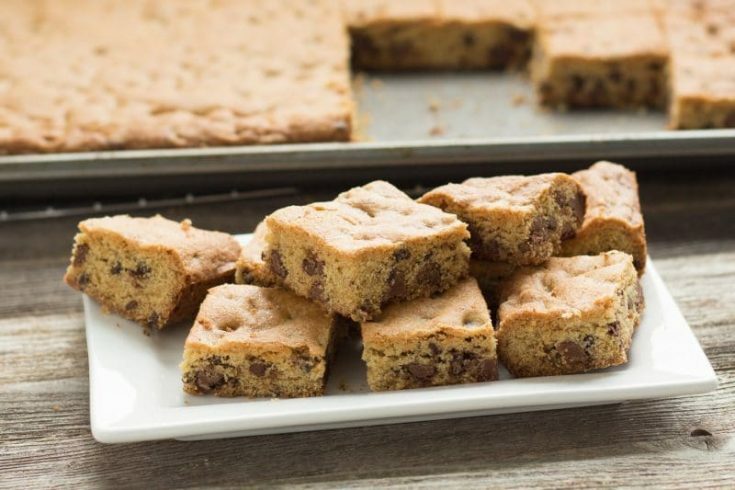 These Chocolate Chip Cookies Bars are no thin, little cookie either. One of these cookie bars should be more than enough to satisfy your sweet tooth. There are 3 different kinds of chocolate chips in these bars; mini semi-sweet, regular semi-sweet, and milk chocolate chips. I have used half semi-sweet and half milk chocolate chips cookies in my regular chocolate chip cookies for years. People always tell me they are the best chocolate chips cookies they have ever had, and to be completely honest, I ever use anything more than the Tollhouse recipe from the back of the bag, add 1 teaspoon of extra vanilla and use half milk chocolate chips. That idea of using three kinds of chocolate chips came from making the $250 cookies that call for semi-sweet chocolate ground in with the oats but uses milk chocolate chips or chunks in the cookies. I have also used up whatever extra white chocolate chips I might have laying around instead of using semi-sweet regular sized chips. We prefer the version and amounts listed in this recipe. I use extra vanilla in most of my cookie recipes. It’s been a hot minute since I have read somewhere that using extra vanilla was the secret to Mrs. Field’s cookies and I can believe it since it does make a difference. I have been using extra vanilla ever since then. Less vanilla can be used in this recipe, so don’t be alarmed at the full tablespoon I use. I buy my vanilla in large bottles and my preferred brand is Nielsen-Massey. It may seem a little bit expensive, but when you compare the price ounce for ounce with the pure vanilla extract at a grocery store, you might find that it is actually a little cheaper. The next time you need a lot of vanilla for something like holiday baking, I encourage you to buy some Nielsen-Massey in a 4-ounce bottle. Heck, if you have a ton of baking, you could even buy the 32-ounce bottle. When looking at the prices of vanilla, remember this particular bottle has as much vanilla as 32 1-ounce bottles that are readily available in grocery stores. Even if McCormick is your preferred brand, I recommend buying the 16-ounce bottle. Good vanilla is cheaper when purchased in bulk. It will last for a really long time and I even think that the flavor improves as it sits. A high-quality vanilla will elevate the flavor of baked goods and other desserts. The Kitchn interviewed some baking experts and they agree. You can see what they have to say about it here. Don’t forget to follow us on social media by using the buttons below! Join our mailing list to be notified by email anytime we publish a new post! 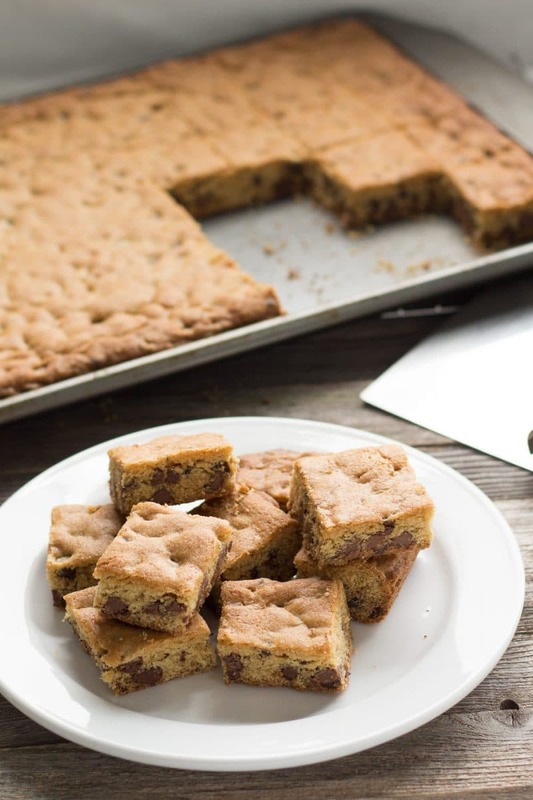 Large Batch Chocolate Chip Cookie Bars. soft, delicious cookies designed to serve a crowd. Spray 12" X 16" baking sheet with baking spray. In a large mixing bowl add butter, sugar and brown sugar. Beat until fluffy and sugar granules begin to dissolve. Add vanilla and beat cookie dough until fluffy and sugar granules have almost disappeared. You want a smooth texture, it will not be as grainy as when making other chocolate chip cookie recipe. Add baking soda and beat until incorporated. Add flour and mix just until flour has been blended well. Add chocolate chips and mix just until chocolate chips are spread through the batter. Over-mixing after flour addition will result in tough cookies. Spread cookies on the prepared baking sheet. Use hands damped with water if necessary to get it spread evenly to the edges. Place in preheated 350 Degrees F and bake for 24 to 28 minutes, or until edges are golden brown and middle does not look wet. Remove from oven and allow to cool on a cooling rack for at least 20 minutes before attempting to cut.